Operating Era: 1944-1971. THIS SERIES OF KITS NOW COMES WITH OUR NEW ONE-PIECE ROOF FRAME. Chicago, Rock Island & Pacific. 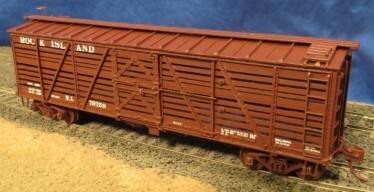 The Rock converted 606 B2 box cars to single deck stock cars in 1944-50 and they ran into the late 1960s.The cars had Hutchins or XLA roofs.